From my rotting body flowers will grow, and I am in them and that is eternity. Looks: Evangeline is a delicate she-wolf, her body wired like a flowers. Under the thick tuffs of autumn fur, Eva is rather skinny with long, wiry legs. She's small, fragile, yet the thickness of her fur gives the illusion that she's somewhat bulky. Her muzzle is slender and short, resembling a foxes while her ears are sharply pointed. Her orbs are large like a doe's, eyes as green as spring grass. Her fur is long and silk like, different pigments running and weaving around her body, colors varying from browns, blacks and white. Personality: Evangeline is a very gentle soul. Her words come out as soft coos, and she never speaks without considering her words first. She's sweet, always seeing the light and life in everyone's souls, even if they may be cruel and wicked. Evangeline is rather quiet, secretive with stories unspoken replaying in her mind. While she is friendly, sweet, gentle and caring, Eva can be strict, and won't hesitate to nip at a wolf if they push her too far. She's cuddly, and respectful, wise and playful, and simply adores young pups. Background: I was born on a dark, summer night. Birds were singing themselves to sleep, while the crickets whispered secrets to one another. Fireflies wandered around like candle sticks, and the moon smiled down at her children. I remember little of that night. The ground was hard, and cold. I couldn't see. I don't think I could hear. I couldn't walk. Just wiggle. I remember someone's warm tongue run across my small head and down my spine, and I was suddenly squirming, whimpering for that touch just once more;I sought out the warmth of my mother. I remember bumping into her stomach, and opening my small maw to suckle upon a small mound, and was delivered with a yummy treat of milk-it was warm and slivered down my throat and settled in my stomach wonderfully, leaving me feeling warm and comfortable. Others moved around me. Someone's paw connected with my side and I remember falling asleep with my brothers and sister curled around me. And I was happy. Days passed. I grew, as did my siblings. I could hear. See. I remember opening my eyes and seeing the world as a blur. My mother laughed when she heard my confused huff. I saw other's my size, three to be correct. Mother began to name us off from the first born, to the last. I awaited eagerly to hear my name, to hear her voice whisper it. Another she-wolf lay beside my mother, and they took turns murmuring our names. My name. I was Evangeline. Youngest born of Maya and Shoka, and the niece of Hige, the alpha. My siblings and I were named after our ancestors, and I was delighted to hear that I was named after my grandmother, a she-wolf whom used to run the Masons pack when her mate passed. Brassa was the she-wolf closet to my mother. They were close friends, told me that they sometimes thought they were meant to sisters. She was my Nanny, someone that kept us entertained, safe, and happy when my parents and other wolves were away. She was like my second mother, and I cherished the hours I spent with her. As I grew, the pack did too. 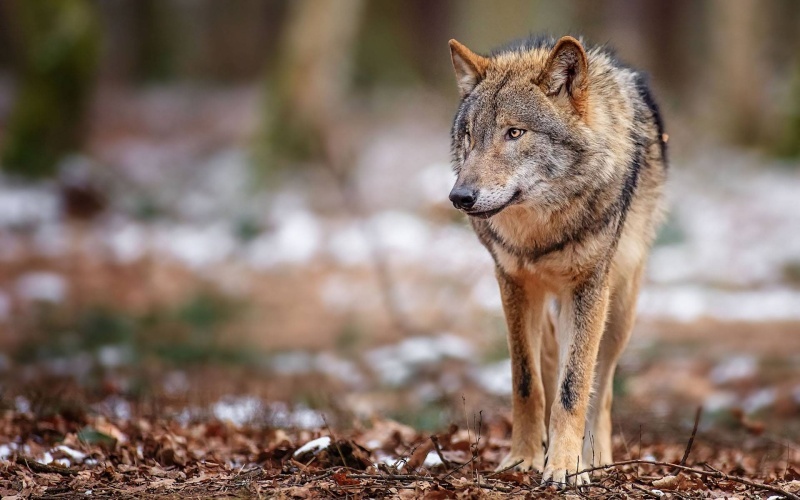 More lone wolves joined us, and the adults hunted more frequently then they had before. Hige hadn't allowed me to join the hunt yet, and I was silently jealous of my brothers as they ran along side the bigger wolves. When you joined the hunt, you became an adult. You were no longer a yearling, a pup. I longed to be among the adults, to feel the ground beneath my feet and the wind through my fur. "'Ello, pup." Edgm would call, blood staining the fur around his maw. Nelli would follow, smirking. Alura always stayed away, she was never one for teasing and fun. She was very serious, and stayed close to mate, Alec. She was only one year of age, yet she still went behind our parents back and mated with the older brute. Hige said there was nothing that could be done. My fur bristled. "Don't call me that! I'm not a pup, Edgm!" I cried, ears flattening as my brothers circled me, as if I was the deer and they the wolves. Nelli nipped at my hide, and I squealed, tucking my tail and spinning around, only to have Edgm's teeth clamp down on my scruff and he held me down, giving Nelli the chance to attack me, his teeth nipping at my fur and tugging the skin. I yelped. "Enough!" A loud voice cried, and my brothers jumped away from me, and we all turned to see Hige bounding down from some boulders. Beside him was Fell and Larka, Hige's son and daughter, my cousins. They were the warriors of the pack. Hige was upset, as Fell and Larka were. Something was wrong. My mother and aunts appeared from the clearing, and everyone's attention was on Hige as he walked dangerously slowly towards my father. "Explain yourself, Shoka. What is this? Sheep? You bring us sheep?" Hige growled, yellow teeth bared. I tilted my head to the side and slipped under my mother's feet, and stared at the beast that my father and brothers had brought back for us to eat. "But of course it's sheep, Hige. What else would you have us do? Travel for miles, chase a bull for some more miles, kill it, and drag it all the way back here? Yes, we could have done that, as we do nearly every few weeks, but why when there is a human land not too far from here that carries sheep and cows and horses?" My father answered, and a fight broke out between wolves. Brassa lead me away from the chaos just after I got a taste of the sheep. No one but my family wanted it, so I got to taste the creature before Brassa scolded me, and nudged me away from the scene. One out of ear shot, the she-wolf with a brilliant ebony coat sighed. "I do not blame your father, Eva. I just think it stupid. Humans will begin to notice, darling, they always do. They will grow angry. And we will be punished for our actions." She mumbled, and I stared into her bright yellow eyes. But papa didn't listen to Hige, nor Brassa. He continued to feed off of the sheep, and on a very fateful right, I realized Brassa was right. We'd pay for our sins. I awoke to screams, howls, the sound of dogs barking. The forest was on fire. Animals ran from the fire, and I wildly looked about, crying out for my mother, my father, and my siblings. "Evangeline, run!" Someone cried, and I gave a cry of protest, although in the end, I did as I was told, and ran for the river. Foxes ran alongside me, deer scattering stupidly as if I was the only thing they should fear. I knew it was stupid-to run for the water when I knew, I just knew, that that's where they'd be waiting, but instincts took over, and all I could think about was reaching it, and allowing the cold liquid to clear my burning lungs. I was met with the sound of gun fire. I had reached the water, and as other animals swam to the other side of the river, I stopped, and gulped down what I could when I heard it-it was like a thunder clap, but I knew better. I turned, and watched as my sister fell. I'd recognize her anywhere-she was beautiful. She cried out for me, for mother and father, for Edgm and Nelli, but I didn't respond. I simply whimpered when someone's maw wrapped around my scruff and they dragged me into the bushes. She took me away from that land, that night, leading me into the mountains and away from the lower lands. She became my new mother. I dreamed of my family every day and night, wondering whom was alive still and if they looked for me. I cried for the wolves that fell down dead or wounded, either from the fire or from mans guns. But Brassa taught me how to be forgiving and strong, kind and wise. She died on a beautiful spring day of old age, and I stayed with her body for days, refusing to leave her side. I wasn't sure why. It just seemed impossible to part from her side, but I came to realize that Brassa would never have wanted me to mourn for her. She'd want me to move on, and share my love with others. So I've made a vow to live my life the way mother, father, my siblings, and Brassa would have wanted. I was going to find a new pack and I was going to cherish the moments I have with them, like I cherish the memories of old pack.